Parrot makes the coolest looking toys: robots that zoom through the air and jump over obstacles just by tilting your phone. Now, they’ll do a whole bunch of sweet new tricks—if you trust Parrot with your money. 1.) Revamped versions of the Rolling Spider, a quad-copter about the size of your hand with a camera that points straight down. One new version has LED headlights to help you fly in the dark, another can carry Lego blocks, and the third can use its powerful little propellers to send a hydrofoil boat zipping across water! 2.) Revamped versions of the Jumping Sumo, a two-wheeler that speeds along the ground, hops 2.5 feet into the air, and sends a live feed from its front-facing camera to your phone. Here, both new Jumping Drones have built-in two-way radio communication so you can talk to people from a distance after you run into their ankles. One adds LED headlights for nighttime crusing, and another has bigger wheels for zipping along at up to 8 miles per hour (compared to 5.3mph for the original). So what’s the problem? We never really liked the Rolling Spider or the Jumping Sumo, and have had plenty of trouble with Parrot drones, period. The laggy smartphone controls have always been an issue, not to mention their short and iffy wireless connectivity. These new versions of the Rolling Spider still connect via Bluetooth, with an extremely short maximum range of just 20 meters—not far enough that I’d trust the hydrofoil in any body of water larger than a backyard swimming pool. If you’re looking for a good beginner drone, these are the ones we’d recommend. 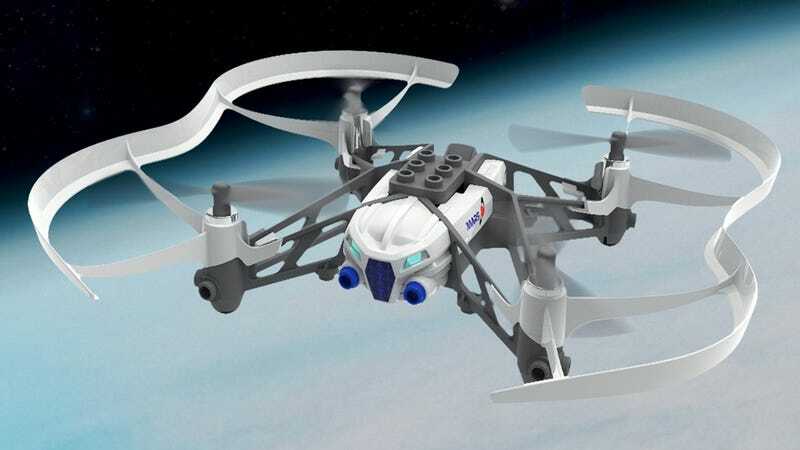 Still, gotta admit the Lego drone looks cool. Maybe we should try it real quick just to be certain. No US pricing or availability on these yet, but they range up to €199, or around $220.